simms Lightweght wading jacket. Condition is Pre-owned. 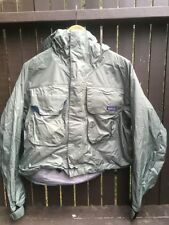 I believe this might be the Freestone line... it is Gore-Tex all seems are taped but it is lighter weight.. used once..Shipped with USPS Priority Mail. CH: 26" SH: 24" L: 23.5" SL: 27". Condition: 8.5-9 of 10. MENS COLUMBIA PFG OMNI-TECH FISHING WADING WATERPROOF JACKET XL BLACK. Condition is Pre-owned. Shipped with USPS Priority Mail. 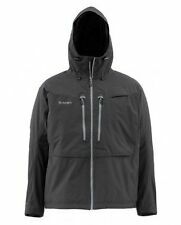 Simms Freestone Jacket - Coal - Size L. Two storage pockets provide plenty of safe keeping for your essential gear. Check us out on the web, or in person at. About Chicago Fly Fishing Outfitters. 1 fly patch & 1 net D‐ring. NEW Frogg Toggs Pilot II Guide Jacket. The Frogg Toggs Pilot 2 Guide Jacket features DriPore C3 breathable technology. 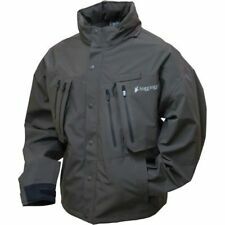 Fishing Wading Outerwear PF63104-44XL. Hood Stows Away In Collar. which is more waterproof and breathable than most breathable waders. Condition is Pre-owned. This technical fishing jacket is made from triple layer 50-Denier stretch-woven nylon with a waterproof and breathable H2No® barrier and a Deluge® DWR (durable water repellent) finish. PFG / PROFESSIONAL FISHING GEAR. Left chest pocket has cord-attached fleece fly patch which attaches to top of pocket when in use. Omni-Tech fabric is waterproof and breathable. D-ring attached at centre back, base of hood, to attach landing net. Simms Windstopper Gore Fleece Wading jacket, color dark loden size Men’s Medium. Condition is Pre-owned. Shipped with USPS Priority Mail. Wading Jacket Baleno Outerwear. Water proof. Size large. Condition is Pre-owned. Worn only a dozen times. I don’t fly fish anymore. Has several large pockets for fly boxes and net ring on the back. Shipped with USPS Priority Mail. The label identifies it as model 921944. It was acquired several years ago for fishing in the far-north. The main use was as a fly fishing / wading jacket although it’s great for any type of fishing. Simms Bulkley Jacket. Storage pockets house multiple large fly boxes while the water-resistant zippers keep contents secure and dry. Shingle Cuff™ construction in the sleeves eliminates line-catching points for snag-free casts. Waterproof Fishing Jacket Rainwear. Elastic Waist and Sleeve Cuffs. Oversize Hood with Drawstring. Gillies Irish River Coat. 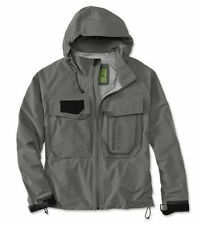 Waterproof fly fishing wading jacket. "The Irish River Coat is constructed of StormSeal®, a waterproof, breathable laminate fabric with a soft, suede-like hand. Comfortable fabric is just one of the many features of this coat. Built to fish, the lightweight Simms® Guide™ Jacket will keep you dry and functional in a monsoon. Backed by a three-layer Gore-Tex Pro shell, the Guide provides waterproof, breathable, and durable protection to ensure long-lasting wear in a wide range of weather conditions. This fishing jacket was only worn once. It's warm and waterproofing makes it ideal for fishing, hunting, hiking or any other outdoor activity. Please note that the picture of the hood shows it wrinkled since it has been stored in collar. Lots of pockets and a "d" ring for net on back at collar. No noted flaws. We are a smoke-free home. Thank you for looking. Finally, the wading jacket we have all been waiting for. Layer for frigid weather, row, and cast in comfort. In blue/gray. 100% nylon. Imported.Sizes XS(4), S(6-8), M(10-12), L(14-16), XL(18-20). NEW Frogg Toggs HellBender 2.5 Jacket. The Java Hellbender Wading and Fly Jacket combines classic wading features. Fishing Wading Outerwear JT62105-05XX. • Adjustable neoprene and Lycra sleeve openings for watertight casting. FRONT RISE IS ~. B ACK RISE IS ~. I ONLY LEAVE. I ALSODO NOT AND WILL NOT. THE CHEST IS APPROX. Item is in great shape see pics. FROM THE OUTER SEAM DOWN FROM THE TOP TO BOTTOM IS ~ 25.5. COLOR IS ~ GREEN. NEW Frogg Toggs Pilot II Guide Jacket. The Frogg Toggs Pilot 2 Guide Jacket features DriPore C3 breathable technology. 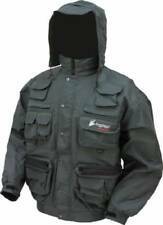 Fishing Wading Outerwear PF63104-44MD. Hood Stows Away In Collar. which is more waterproof and breathable than most breathable waders. 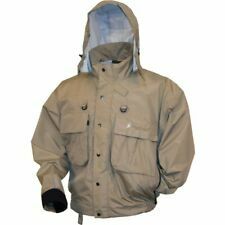 Frogg Toggs Java Hellbender Fly & Wading Jacket, Stone. Size Large. Lightweight,tough nylon construction is 100% waterproof,windproof and breathable. honors Vernon's legacy as we continuously strive to spread and support a love of the outdoors. treated everyone with respect and never let challenges hold him back. Loaded with angler-designed features, Frogg Toggs' Pilot wading jacket is lightweight with a layer-friendly fit and DriPore waterproof protection. Fully seam sealed for complete waterproof protection. Storage pockets house multiple large fly boxes while the water-resistant zippers keep contents secure and dry. Shingle Cuff™ construction in the sleeves eliminates line-catching points for snag-free casts. Anika Fit: Formfitting and longer in the torso, with a wider, deeper neck (not quite scoop). Regular Fit: Neither slim nor oversized. Slim Fit: Closer-fitting. Formfitting: Conforms to the body’s contours. ORVIS WADING JACKET. WATERPROOF / WINDPROOF NYLON SHELL. DRAWCORD HOOD AND WAIST. Jacket Chest Size 34" – 36" 38" – 40" 42" – 44" 46" – 48" 50" – 52" 54" – 56". Shirt Neck Size 14" – 14 1/2" 15 "– 15 1/2" 16" – 16 1/2" 17 "– 17 1/2" 18" – 18 1/2" 19" – 19 1/2". Marked Woman’s Size XL. Hood can fold and tuck into color. I might not have known enough to provide the right details. Most of all I try to be as fair as possible. Fully seam sealed for complete waterproof protection. 2.5-layer Ultra-Lite premium waterproof breathable fabric. Attached, adjustable hood. Welded seam technology eliminates stitching. Regular Fit: Neither slim nor oversized. The Prestige² Wading Jacket is 2” longer than many on the market, so it can also be worn in a boat, with the over-trousers. The 3-panel integral hood is fully adjustable and can be rolled away into the collar when not in use. 100% nylon with PU lamination. •Two way stretch 3-layer waterproof breathable nylon shell fabric. •Three-way adjustable storm hood with laminated brim. •DWR (Durable Water Repellent) finish repels water from fabric surface. 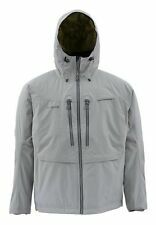 ORVIS Men's Ultralight Wading Jacket - SM - NWT $50 OFF - SALE! 100% nylon with PU lamination. Two way stretch 3-layer waterproof breathable nylon shell fabric. Three-way adjustable storm hood with laminated brim. DWR (Durable Water Repellent) finish repels water from fabric surface. Loaded with angler-designed features, Frogg Toggs' Pilot wading jacket is lightweight with a layer-friendly fit and DriPore waterproof protection. Anika Fit: Formfitting and longer in the torso, with a wider, deeper neck (not quite scoop). Columbia's new Rain Destroyer PFG wading jacket will make sure you don't miss an opportunity to wet a line. Featuring 100% Omni-Tech?. Neo Matrix?. Lining is made from 100% nylon 210T taffeta. With a ball-cap hood for protection, this jacket can take anything Mother Nature dishes out.